(star) identifies 2 positive aspects of the work of a peer. What did you like about the blog post and why? Compliment in a specific way. It is a great way to begin a comment. "I really liked your vivid descriptions of the theme park. It made me feel I was there." (wish) Expresses a wish about what the peer might do next time in order to improve another aspect of the work (identify an area that needs improvement). "I want to give you a star for the start of your story and a star for the way you described your house. I wish that you will tell us more about Billy." makes connections to your own life or learning. Add new facts. If you know something about the topic, add more factual information. Make a connection to yourself, to the world, or to another text. "Your post reminded me of the time I went to Great Adventure two years ago." written in a positive way (looking for things to do well). Compliments the blogger in a specific way. Reply has question(s) for the blogger. Try to start a conversation. Ask the blogger a relevant question and hopefully the blogger will reply. Reply is written in letter format (only first name at end and state, country mentioned; started with a greeting; addressed blogger by name). connects your reaction to the blogger's intent. Put yourself in the place of the blogger. Why did the blogger write this particular piece? What's the ONE thing the writer wants you to know? A link to the main page of the replier's blog is provided at the end of the reply. Person commenting obviously proofread the reply before submitting. Many people may read your comment. Instead of using an exclamation mark, use stronger words to show more excitement. Reread your writing aloud to yourself before submitting. Write a capital letter when writing the word "I." Use capital letters at the beginning of sentences and punctuate at the end of sentences. Check your spelling to show you took your time and care about the writing you share. Wow! That painting on your blog post looks so real. I felt like someone was surfing on the water. I really think that was cool. Could you imagine walking on that? I also liked your vivid description of your art classroom. It made me feel like I was there. I imagine being in a place with paint brushes in glasses with water, student work all over, and paint splatter all over the floor the way you described it. I wish you would tell me more about your art teacher since you mentioned she is your favorite teacher at school. I wonder how she is different than the other teachers at your school. Maybe you can describe her the way Joanna Coal described Ms. Frizzle in the Magic School Bus series. I want to know her personality and the way she looks. I wonder how you could do a chalk painting like that. Would you need a different kind of chalk because it looks like you can't do that with normal chalk? Good job John! Your blog is really coming together. **As you can see in the above reply Ana mentioned 2 stars (2 positive aspects of the blog post and explained WHY). She made a wish (mentioned an improvement that could be made/gave a helpful suggestion and explained the suggestion). She asked a question to start a discussion with John. Ana made sure it was written in letter format. Hi, Mrs.Vilas blog. Great posts by the way. 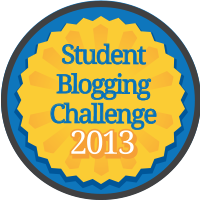 Do you want to check out our blog the link is http://mrsmh.primaryblogger.co.uk/ our blog is amazing!!!. Just like yours. My name is Mrs. Alicia Vilas, and I teach 4th grade in New Jersey.